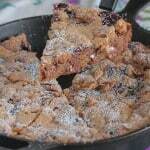 This irresistible berry crumble was inspired by this gorgeous Fall 2012 Chenille bag below…. the Petunia Pickle Bottoms Elderberry Boxy Backpack. The folks at Petunia Pickle Bottoms are offering one of their new bags to a Picky Palate reader! How fun is that? See below the recipe on how to enter. Iceberg blue and light grey vining garden design. Iceberg blue water-resistant linging and straps. 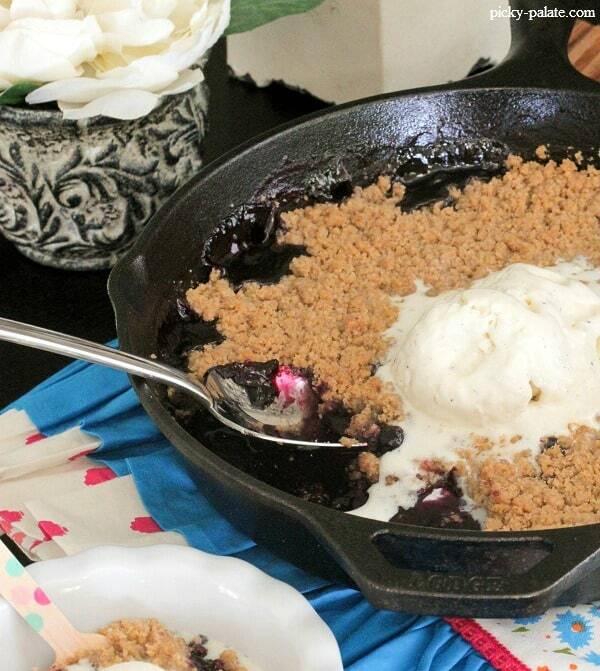 I LOVE using my cast iron skillet….for recipes of all kinds sweet and savory. 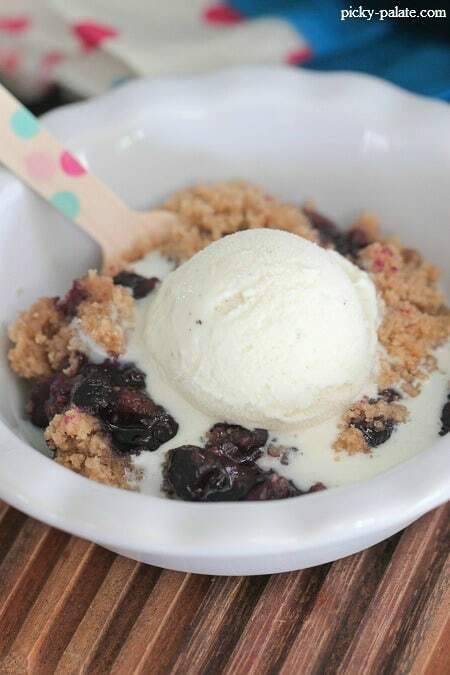 It certainly makes a rustic and beautiful berry crumble that I have shared with you today. I like to describe this dessert as family style where everyone grabs a spoon and digs in together. More fun that way. 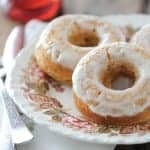 It’s great for a special family night or Sunday dinner dessert….and it’s done in about 30 minutes, woohoo! 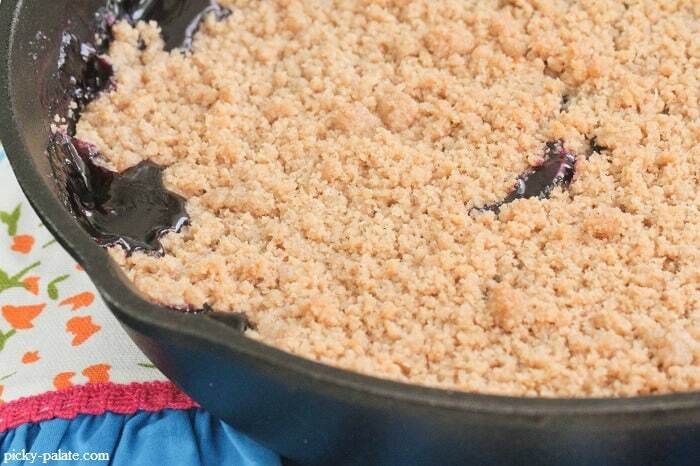 I love seeing the berry filling ooze out of the buttery crumble topping. I’m salivating just thinking about it! Place blueberries, corn starch, lemon juice and sugar into a 9 inch cast iron skillet over medium heat, stirring to combine. Stir and cook until bubbly and thick, about 7 minutes. Turn heat off. To prepare crumb topping add flour, brown sugar, cinnamon and salt into a large mixing bowl, stir to combine. With a pastry cutter, cut in ice cold butter cubes until small pea size balls form. This takes a good constant 5 minutes of cutting butter into flour mixture. Pour crumb topping over blueberries and bake for 25-30 minutes, until blueberries are bubbling and crust is golden and firm to the touch. Remove and serve with warm with ice cream on top. 1. Leave a comment here telling us: What is your favorite berry and who would get the bag if you win? A friend or you?! 4. Contest ends Sunday August 12, 2012 8pm PST. Winner will be chosen via Random.org and notified by email. Winner will have 48 hours to return my email to claim prize. All the berries have been so tasty this year, but I have actually been obsessed with blueberries! And this bag would be perfect for my sister! I follow PP on Pinterest! Blueberry, and my wife would get the bag. 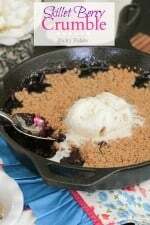 omg, this berry skillet look amazing! Choosing a favorite berry is hard! Lately I’ve been into raspberries though. I love summer strawberries! Nothing is better, and strawberry picking and jamming is my favorite part of summer. If I win (I sure hope I do!) I’d keep the bag and use it to cart around stuff for my two littles – a 9 month old boy and 3 1/2 year old girl. I am subscribed to Picky Palate feeds via email. I love raspberries…. the bag would go to my sister. Raspberries! My friend Stacy would get the bag…she just adopted baby Nola after waiting for 10 years for a baby! Strawberries. I think I would keep the bag for the future little ones. I subscribe to Picky Palate on Google Reader. Huckleberry! This bag would go to my coworker, who is expecting her first baby in a month. My favorite berry would be strawberries. I would keep the bag for myself–selfish, I know, but I’ve heard they are amazing! Ever since living in Oregon for a few years, I have fallen in love with Marionberries!! 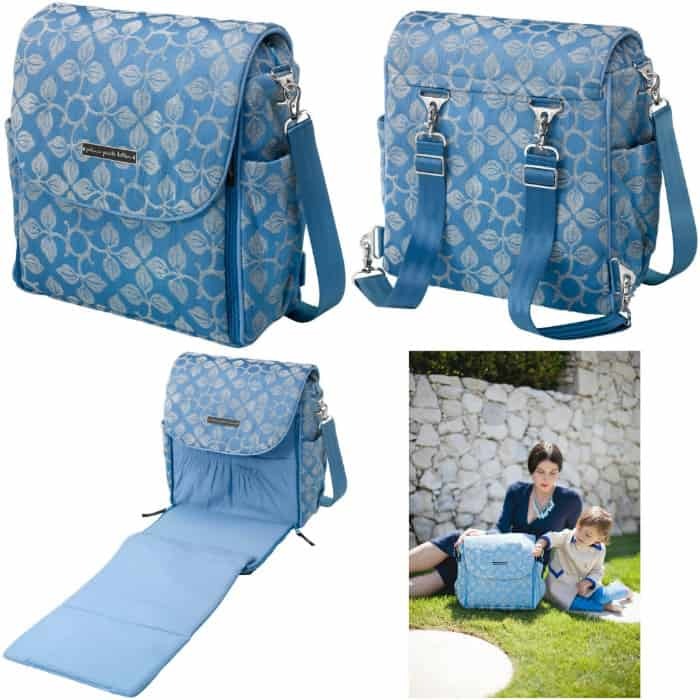 I am expecting my third baby in just 8 weeks; so, I would love this bag! I love blueberries! I would use the bag for my baby girl! My favorite berry is strawberry and I would keep this for myself! My favorite berry would be the blackberry even though i Love all berries and eat them alot. 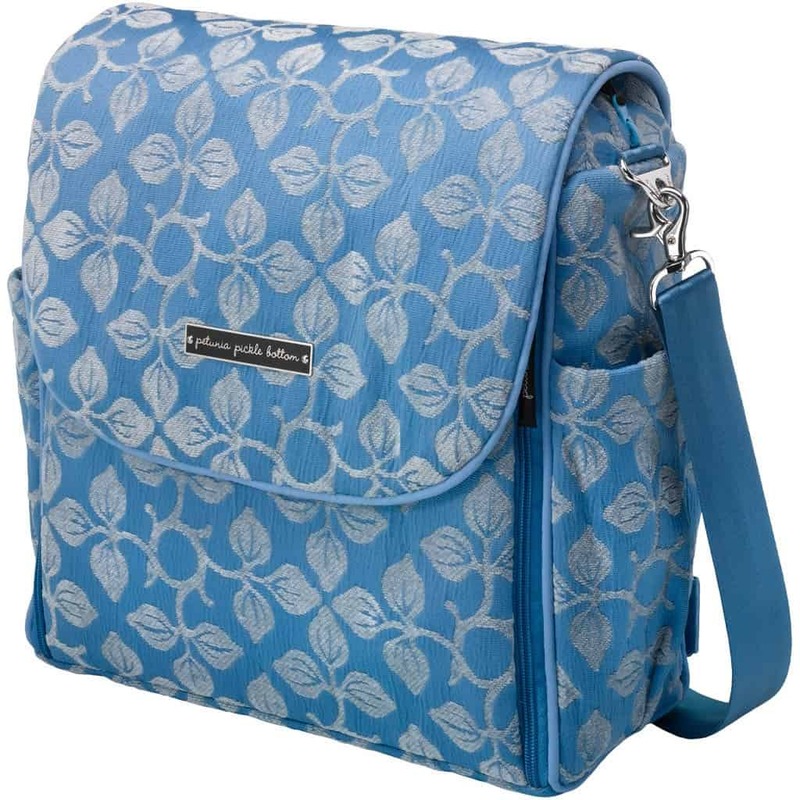 I would keep the bag for myself because it is to nice and pretty to give away! My favorite berry is raspberry!! And I would get the bag!!! ME ME MEEEEEE!!!! I subscribed to PP via emails. I love any berry really, but I think blackberries are my favorite. The bag is great…I’d love it for myself, but I might give it do a dear friend since it’s such a nice gift. My favorite berry is blackberries! If I won the bag, I’d keep it for myself as I’m expecting our third child in March and already got rid of all my baby stuff!! I follow Picky Palate on Twitter! My favorite berry is blueberries. I would keep the bag – I’m due in October, so it would be perfect! !